The Chinese yard Kingship will start the construction of Green Voyager, the first yacht in the world under 50m built to RINA’s Green Plus Class standards. Designed by Axis Group Yacht Design, her hull has already proven during the tank testing it is 16% more propulsion efficient than a conventional yacht of the same size. To complete the green side, solutions like heat reflecting glass, high insulation, heat recovery, heat pump calorifiers, gas treatment, ultra efficient props, bio lubes and others will be chosen to reduce the power demand by 20%. Built in steel and aluminium, this 43.9m superyacht has an interior designed by an in-house team with accommodation for 10 guests in a master, two doubles and two twin cabins. On the technical side, Green Voyager will be powered by twin Caterpillar C-32 engines giving a top speed of 16.5 knots and a range exceeding 6,000 nautical miles at 10 knots. This propulsion will be completed by a diesel-electric Siemens SiShip Ecoprop system. 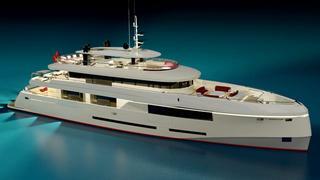 Low energy consumption, clean and compact, the construction of Green Voyager will start soon.